PITTSBURGH, PA (CBS 8/WFTV) - It's a photo that has gone viral in the last few days. 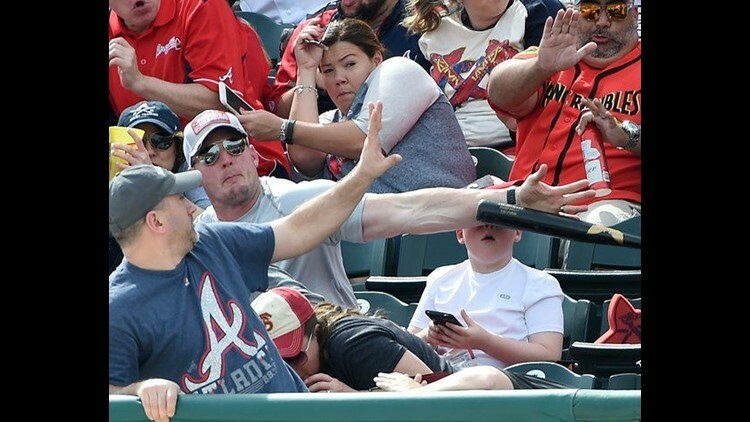 A fan at a Pittsburgh Pirates spring training game only had seconds to react when he spotted a bat flying towards the stands and into his son's face. When the bat slipped out of Pirates outfielder Danny Ortiz's hands, Shaun Cunnigham sprung into to action and threw out his arm to protect his son, Landon, who was only seconds away from being struck in the head by the wayward bat. In the photo, captured by Tribune-Review photographer Christopher Horner, Landon can be seen holding a cell phone, which he was using to send pictures to his mom and sister. The photo also shows the faces and reactions from the surrounding fans as they duck to avoid the incoming projectile. “The barrel of the bat hit my wrist, when that happened I guess it deflected and spun it and the handle got him in the shoulder, which, I'll take that over the alternative,” Shaun said to WFTV. Both father and son walked away uninjured and Landon got to keep the bat. Video report from WFTV via CNN VAN.